I can't see a pic for this - is it just me? There are so many patterns without names - over 10% of the Gallery photos! 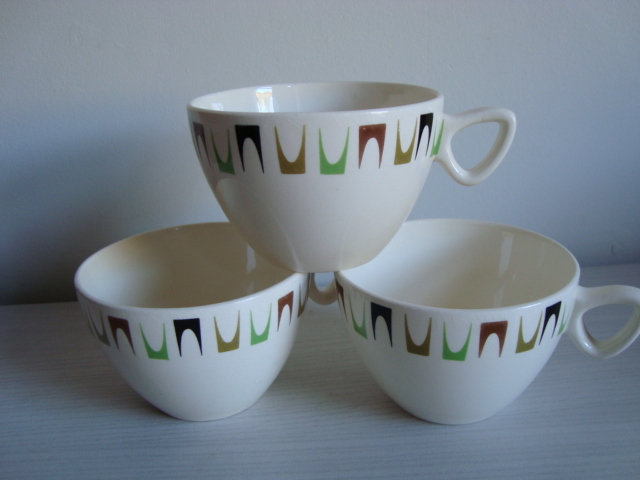 I have three lovely shallow type cups with this pattern. Just wondering how common or scarce the pattern may be. Any ideas please ? (Just heading out so no photo sorry). 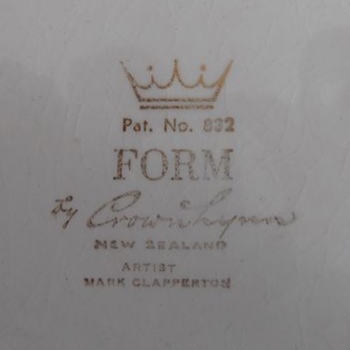 Also, the plate in the no name gallery....p.3, 2nd one in from the left - and on the line with the 'orange spotty dotty' cup on the end - is Earthstone Landscape I believe. The same, I think, as T/Me expired auction # 570622620. Apologies. I'm well behind the 8 ball on the Landscape!!! I just love the shape of these cups. Not sure what the saucers would look like but they would mix and match nicely with a colour glaze one as a temporary measure. Feel free to use the photo for the gallery if you need to Ev. That's the funky shape that keeps coming up at the moment. "Enlarge and thicken new handle for shallow cup." "This stunning red tango c&c set are for sale on T Me. The cup shape is unusual and I don't think it is in the gallery. This is the cup shape for the red tango cups I queried. And they are on saucers too! hazlette was wondering about pairings of Air New Zealand cups in Form pattern. I have used my Cook and Serve to create a montage of pairings based on the colours contained within the pattern. My Form saucers came with three different can colours, white, lime, and Form. The remainder of the pairings below are made up using the colours within the pattern. 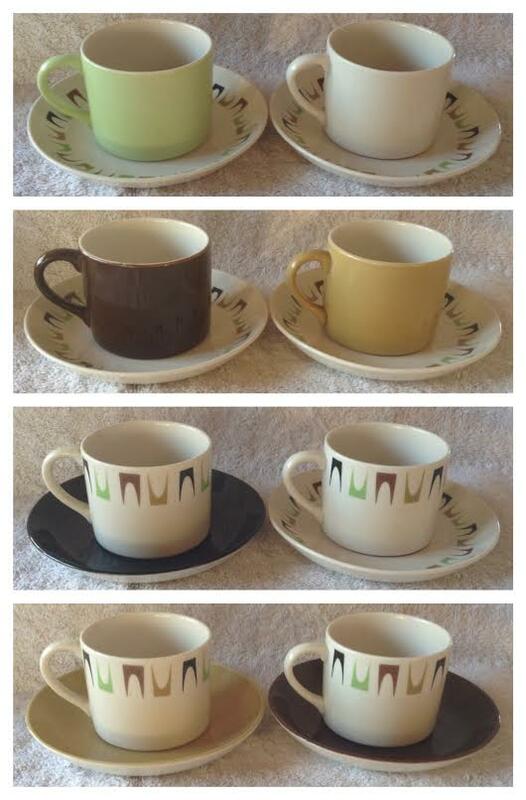 Obviously lacking are black cup and green, and white, saucers: i have never seen any. The pairings were made using what I have so some duos are reversed, with coloured can and Form saucer. The effect with an Air NZ cup shape will be different, but I think I can see lime green or black, or even brown saucers working. 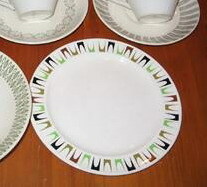 Supposing the cups are vitrified, then I think the right saucer shape would be the 739. Good luck with finding those! If the cups are earthenware they will be 3010s and I think a standard 805 coupe saucer, as for tulip cups, is the correct shape. Unlike black, lime is not too hard to find, so too brown, which looks a lot better as saucer than cup. Ev, did you know what year this article was? As with the Cook & Serve, I think having Form pattern on both cup and saucer is a bit much, but wouldn't you want it anyway! Do you know offhand what the mug shape is? The photo is from the 1965/66 folder and the cup shape is 3010 first made in March 1964. 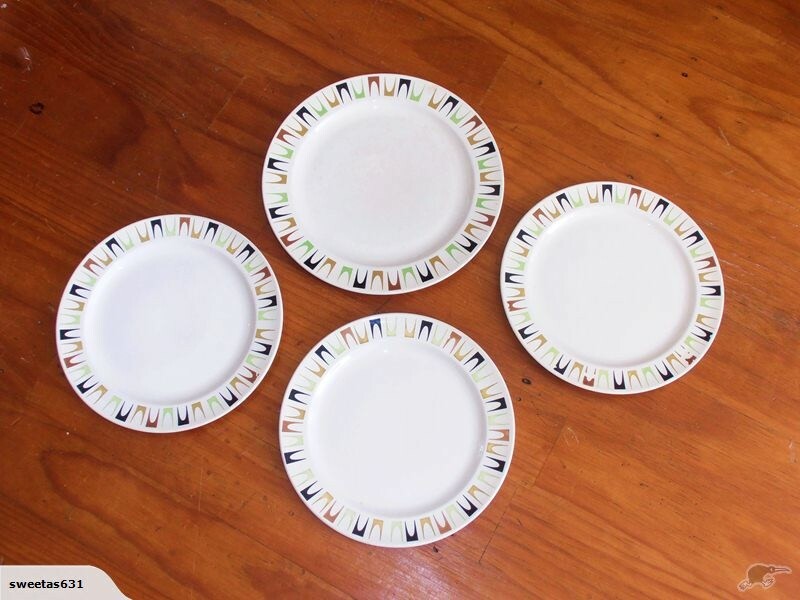 Going by this picture it appears that whole dinner sets were made in the Form pattern. The MUG shape Ev, not the cup. I believe it is number 8 on "Rattling Those Cups", and I understand the shape is 844 "E/W kiddies mug". 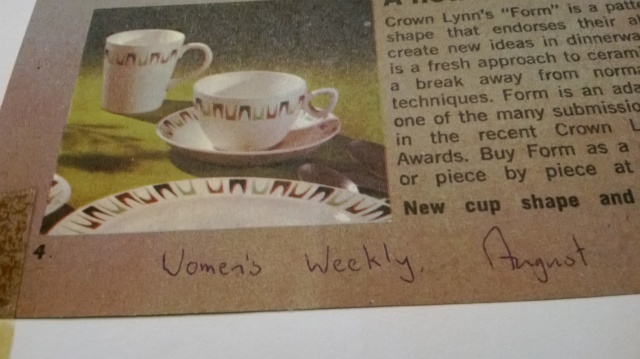 I just lost one at auction which was sold as: "Crown Lynn Roydon Cat tiny tots cup". I believe there is another image in one of those schematic pictures of cup shapes where it is described as a "beaker" (no, not the 728). Oops sorry about that. I wouldn't call that mug a kiddies one as it is a decent size and yes it is described as a beaker in one of the illustrations. Here are some Fleurette mugs in this shape .. Yes, those Fleurette are tempting me. I see you agree on shape but not that shape number. It was the description as "Roydon tiny tots" in the other auction that led me in the direction of 844. No number for that shape yet huh! I think it must be a three digit from the Roydon. 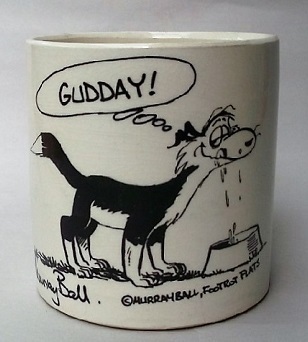 Do you think the mug in this auction is the same shape? No I don't think that is the same shape in that auction. It looks like pic 24 in Rattling Cups montage, which I would like to think is a 750 shape, but can't be sure. Yeah, the handle is at the right height for the 750/Minton Cup, rather than the beaker, but in the photo the base looks more squared off like the beaker than rounded like the cup. Seller says "cup" and it sits happily on the (Soljan) saucer. I've been spending too much lately: I'll walk away from that one! I think both shapes share the ridged handle. Looks like that on my cup. BTW, the cup dimensions are 8.5 W x 7.8 H, exactly opposite those of the beaker. Ev, once you've seen this you can add it to the other Form topic if you like. Thanks Jeremy, I checked the other Form topic when I saw these listed and we have two numbers ??? Are the colourings different? I'm also wondering if the numbers got mixed up when typing them in? My database only has Form 832. There may be more than one pattern. On my 782 cans the staples alternate up/down singly around the can. On everything else the staples alternate in either singles or pairs. I checked three saucers to find the arrangement of staples differs on all three. This makes each saucer (plate, etc?) potentially unique! I'm pretty sure it's a transfer pattern, not brushed, not stamped. The four colours used are the same four in each piece I have seen. I now see that on all items black and brown staples point inwards or downwards, while green and mustard do the opposite. The mustard in the ad looks darker.